We have very little control over the ultimate trajectories of our lives. 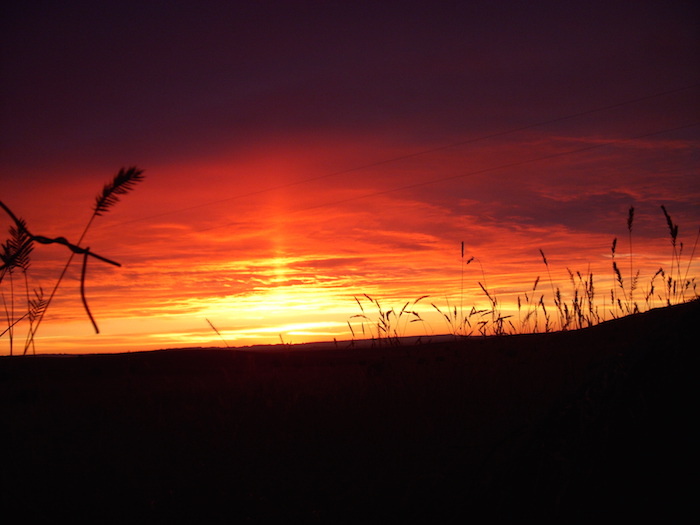 That truth has come home to me on many occasions, but most poignantly in the frosty pre-dawn moments spent in my favorite deer stand, nestled behind a brushy juniper on the edge of a mown hayfield, where field meets forest. The autumn sun slowly breaks the horizon, the world is leisurely waking up. I am keenly aware that something—or nothing—amazing may happen at any moment; all is possibility. This is, if you will, a hunter’s meditation, one grounded in the inarguable fact that it is hunting that marks us human animals as predators—kindred spirits to the cougar and wolf, the grizzly and great horned owl. That we do, indeed must, meditate on the implications of our predation also distinguishes us (at least as far as we know) from those other nonhuman hunters. We human hunters have both the capacity and the responsibility to reflect upon the impact of our actions—our very existence—on the world about us. And then I met and married a life-long hunter. The logical continuity between the meat he brought home and the vegetables and herbs I harvested from my garden was compelling. It wasn’t long before I too was devoting my time and energy to sharpening my shooting and tracking skills. And to thinking and writing about Artemis the huntress, and the women who follow her. 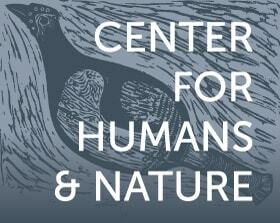 I begin with my own story because for me the question “Does hunting make us human?” can only be a deeply personal one. Twenty-six years ago, my husband Doug and I purchased land in southeastern Montana and established our Crazy Woman Bison Ranch. This move afforded us experience that has become far too rare in our culture: the opportunity, as some environmental thinkers phrase it, to become native to the place where one lives, to enjoy the benefit and luxury of inhabiting the landscape one hunts, where over time one becomes conversant with the ecological vocabulary of this particular place, telling the story of its own particular history. It is a language of hoof prints and game trails, of rubs, spoor and calling crows, of flashes of liquid motion glimpsed too quickly and gone too soon. Nature enthusiasts of various stripe—hikers, birders, wildlife photographers—no doubt learn to speak this language pretty well. But hunters, I believe, speak and hear it with a particularly acute inflection. The deer—whitetails and mule deer—with whom we share this wild space of forested draws and cedar breaks and grassland become almost “familiar”…not in the sense of tameness, but rather of co-habitation. This is especially true of big older bucks. Seeing one of them at sunset at hunting season’s end, we smile. That wily fellow made it through another deer season! Now he’ll live to see another year. He’ll fade back into the forest, shedding those big antlers to assume relative anonymity to the human eye until the following summer. He’s a lucky buck, but more than that. Those big bucks get to be big because they are smart, with great survival instincts. This is simultaneously why successfully hunting them provides such rich satisfaction, and why it is equally (if at times ruefully) satisfying to see the ones who have made it through another deer season unscathed. As deer have their off-season, we have ours, occupied with ranch chores like fence maintenance and repair. Last summer I was thus engaged, walking a fence line that, like many on our ranch, which is fenced with an eye to habitat health and preservation, marks an ecotone, or “edge” where one kind of habitat gives way to another—in this case, sparsely wooded rolling grassland dropping off to a deep and densely forested ravine. The monotony of the task was broken when I spied up ahead a snarl in the wires; something was caught in them. A storm-blown tree branch, maybe? Closer inspection revealed a more grisly scene: the remnants of a deer’s hind legs, horribly entangled, still joined at the pelvis. 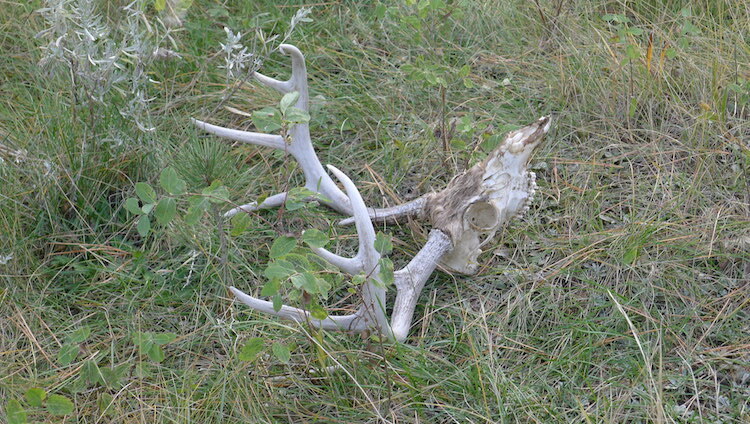 A few feet away lay more skeletal remains, including the skull of a superior whitetail buck. The bones bore mute testimony to how he met his end here. Had his struggle to free himself from the wire been itself the cause of his entrapment? Did he die of exhaustion? Or was he by the time he reached the fence—one graceful leap away from the sanctuary of the forest—already struggling for his life, outwitted by a pack of coyotes or ambushed by a cougar? Perhaps he simply misjudged the way over or through the fence, in the rut and in mindless pursuit of a doe? The precise circumstances of his death are better left just outside the boundaries of imagination. However it happened, he died horribly. That in the natural world those deaths are happening all the time blunts but does not assuage the sting that we humans bore some responsibility. 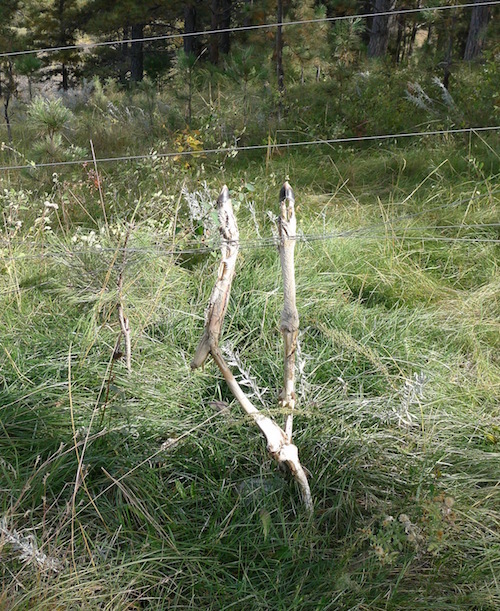 A magnificent whitetail who had survived deer season was done in by a few feet of smooth high-tensile wire. The irony hardly ends there; that fence was a “conservation” measure, built to government wiring specifications to mark a livestock exclusionary area. Fences are never as simple as they appear—especially those we erect to mark off such boundaries as domestic and wild, culture and nature, rationality and instinct, human and nonhuman, death and life. I wish I had encountered that buck the season before he met his end. I wish I had been able to train the crosshairs of my rifle scope just behind his shoulder, gently squeeze the trigger, and give him the good death that he deserved. Mary Zeiss Stange is the author of Woman the Hunter (Boston: Beacon Press, 1997/1998), the first cultural history of the relationship of women and hunting. Stange leads something of a double life—college teaching in upstate New York, and ranching and hunting in Montana, where she and her husband Doug operate the Crazy Woman Bison Ranch. She is the author of many books, essays, and articles on hunting, women and feminism, contemporary religion, environmentalism, and various other political and social issues.